Mandarins have many uses. Freshly squeezed juice can be added to cocktails or mixed with other citrus juice. The segments make great additions to salads and compotes. They also make brilliantly colored marmalades and candied peel. Mandarins constitute the largest and most varied group of edible citrus. They are thought to have originated in China, where cultivation dates back several thousand years. Mandarins were first imported into the Mediterranean region from Chinathrough the portof Tangiers; it was at this time that the name Tangerine became associated with Mandarins. 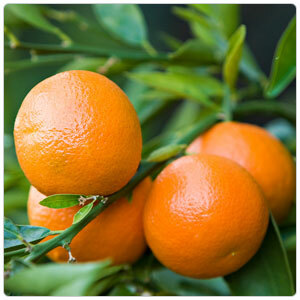 The name tangerine has no botanical standing and the term is rarely used outside the US. The use of the word appears to have developed as a marketing term for various varieties of Mandarins, such as Fairchild and Dancy. To put it succinctly, a mandarin is a mandarin and so is a Tangerine. The Satsuma variety was developed in Japan in the 16th century from Chinese Mandarin stock. During this time of year, dozens of small farms in aroundPlacerCounty (Auburn-Penryn, Loomis andNewcastle) are harvesting Satsuma Mandarins Mandarins are cold-hardy citrus and tolerate near freezing temperatures. Clementines are small like Satsumas, seedless, sweet and juicy with a spicy aroma and get their name from Father Clement Rodier, by whom they were discovered.